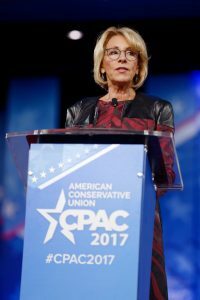 Remember when U.S. Education Secretary Betsy DeVos scrapped the Obama administration’s guidelines on campus sexual assault because they were “confusing“? I’m sure women in college feel safer already. Well, DeVos seems to be confused again — this time over a federal law protecting students with disabilities. This month, the Department of Education rescinded 72 — yes, 72 — guidance documents outlining disabled students’ rights. I’m sure parents with students in special education programs are deeply relieved to be freed from the yoke of meddlesome regulations protecting their children. I’m just throwing this out there, but perhaps DeVos wasn’t being an honest broker in dumping sexual assault regulations. Maybe she’s just not into protecting the rights of women, LGBTs, disabled kids and other groups that have faced targeted discrimination.